Acoustic insulation at Project Pizza, we’re so kind to tenants! It’s been all good so far this week with Projects Pizza, J and Tofu in full swing. Tofu, I hear you cry, what’s that? Soon to be blogged – a bathroom refurbishment incorporating travertine, solid walnut and mosaics – once we overcome the ‘issues’ with collapsing ceilings, shaky joists and wobbly walls! 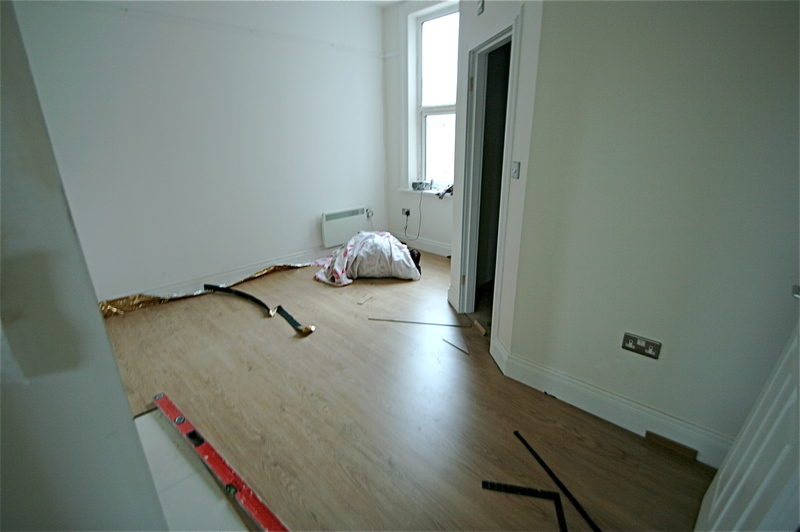 The boys are getting on with fitting the kitchen at J, but meanwhile back at Project Pizza, the last apartment in our own portfolio of rental properties to be renovated, the oak laminate floor is finally going down. To cut down on noise transfer to the flat below, we’ve insulated between all the floor joists and in each bedroom built a lowered then plastered ceiling. As an extra measure I’ve bought acoustic underlay for this apartment. It’s important for me as a landlord to know that tenants are happy in the properties they rent from us, plus it makes financial sense too as happier tenants stay longer. For the bedroom, large living room and hallway, two rolls cost £84 + VAT, which is costly but hopefully will be worth it – never used it before but will be doing a little sound test tomorrow! Gotta say as a known magpie that I rather like the gold look above, somewhat reminiscient of the new metallic rubber tiles I saw last week Is gold coming back? I have a feeling it might just be and soon we may no longer feel that all things brassy are automatically naff. 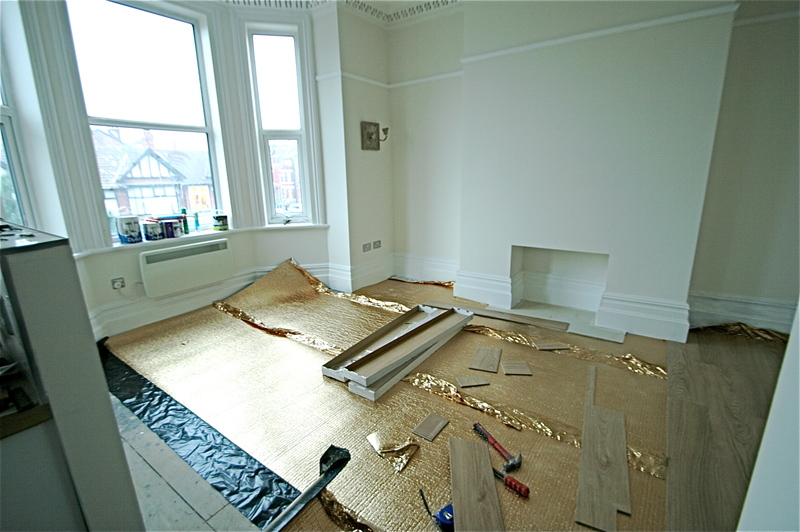 Sadly however as it’s just the coating of the underlay which is rapidly being covered up by oak. This is the bedroom from the doorway from the hall, with the new corner en-suite in place. Bit of a weird angle, so doesn’t even look like you can fit a bed in there but believe me, you can and a double too. That said the ‘big one’ I bought which Mr M hoisted into the cellar now has to go back as the tenants are bringing their own bed. Serves me right for being so organised! Hi Sian, I have just discovered your blog and im addicted already! I have a carpeted top floor flat, which looks shabby, and would prefer to replace it with laminate but was worried about the noise to the flat below and what would happen if there was ever a leak under the floor and I had to rip the whole thing up. Your advice on acoustic insulation is very helpful and has allayed my noise concerns, but is laminate flooring easy to lift up and replace again if required? We have also insulated under our suspended timber floor with rockwool and in the bedrooms put false ceilings in to reduce noise levels. I think it’s more of an issue at your flat as you probably won’t do those things so sound may still be an issue even with acoustic underlay. The other benefit we have is an element of control with noise as we own all the flats in the building so can do sound tests. Maybe speak to the owners/tenants below and check what the noise transfer is like currently? Pingback: Review: Sound Travel & Hush Acoustic Flooring | MOREGEOUS... Making Homes More Than Gorgeous!